After listening to the song of Ramases & Selket, that I posted yesterday, I did a Google search for these people. 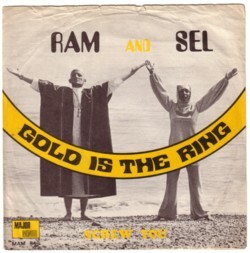 I have two 45’s of them, although on one record they are called Ram & Sel. I bought them because I have a fascination for the culture that built the Sphinx and the Great Piramid, in the place that we now know as Egypt. Based on the pictures on the record sleeves, Ramases and Selket seem to have something to do with that culture. 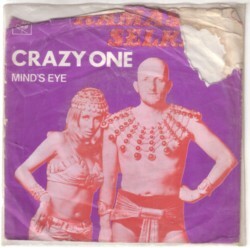 The lyrics are a bit vague here and there, but songs with titles like Mind’s eye or Crazy one are deifnitely no ordinary top 40 songs, but messages of some kind. To my surprise there is an interesting story behind Ramases and Selket. I read that on the beautiful website that Brian Currin makes. Ramases was born in Sheffield as Martin or Michael Raphael. One day he had a vision that made him believe that he was the reincarntion of the Egyptian pharaoh god Ramases, and that he was on Earth to spread the Truth about the universe. So Martin/Michael changed his name and became a pop artist, because seemed to him the best way to do his job. You can read the rest of the story in the biography. And if you have the time, the comments are also worth reading. As always I am fascinated by certain details in the story. Like the miss-spelling of several of his song titles by the record company. I would love to hear the complete ouvre of Ramases. And hasn’t he kept a diary or written a book ? Here is the B-side of the second 45 that I have of the duo, Screw you . I knew the other song Crazy One, but this is very good too. Excellent! Creepy vocals.